The NFL teams geographically closest to Newtown, Connecticut will pay tribute to the victims of the shooting at Sandy Hook Elementary School by wearing decals on their helmets. 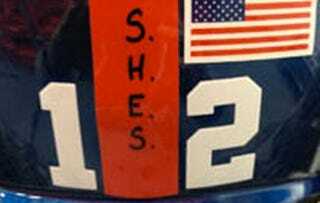 The Giants (pictured above) and Jets helmets will be inscribed with the initials S.H.E.S. Both New York teams are on the road this week—the Giants play the Falcons in Atlanta at 1:00 p.m. today and the Jets play the Tennessee Titans tomorrow night. The New England Patriots will wear the above decal featuring the town seal of Newtown, CT. They will also send up 26 flares before the game tonight against the San Francisco 49ers. All other home teams have been asked by the league to observe a moment of silence.